Android is so intriguing because it's a system that's accessible to the world over, not just the richest in our societies. 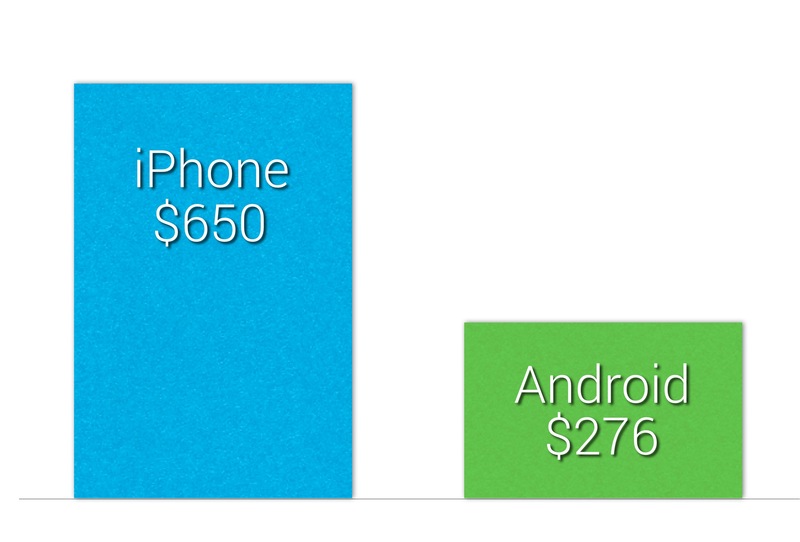 What makes Android so accessible is it's price. According to Sherman, it's on average less than half the price of an iOS device. As of January this year, we've reached a tipping point with a $50 phone, according to Oxford. This flings the doors wide to developing nations and opens a new world of possibilities for apps. We can create meaningful experiences that will transform the world. Phones are now half the price of an One Laptop Per Child laptop and arguably more powerful to empower new people to join the global stage. At Google I/O, they unveiled Android One. This system of partnerships between OEMs and Google will rapidly accelerate adoption in emerging markets – likely surpassing current projections. This project coupled with other initiatives to bring faster Internet connections to the "dark" regions of the world will rapidly accelerate technology in those locations. Emerging markets, such as China, Russia, and India are the fastest growing segment, which provides plenty of new use cases and problems to solve. "Shipments will more than double between now and 2018 within key emerging markets, including India, Indonesia, and Russia. In addition, China will account for nearly a third of all smartphone shipments in 2018." According to Oxford, "two-thirds of South Africans will have a mobile data subscription by 2017, more than doubling" the current usage. Also, predictions estimate that "mobile data subscriptions in Nigeria and Kenya will rise from four percent" to approximately 25%. How can you best impact those markets? Sherman, J. February 18, 2014. Retrieved from http://www.digitaltrends.com/mobile/android-way-cheaper-than-ios/. Oxford, A. January 31, 2014. Sub-$50 Android smartphone hits South Africa as MTN launches Steppa. Retrieved from http://www.zdnet.com/sub-50-android-smartphone-hits-south-africa-as-mtn-launches-steppa-7000025828/. Oxford, A. September 19, 2013. Two-thirds of South Africans will be online by 2017 as mobile data booms, Retrieved from http://www.zdnet.com/two-thirds-of-south-africans-will-be-online-by-2017-as-mobile-data-booms-7000020901/. Smartphone Momentum Still Evident with Shipments Expected to Reach 1.2 Billion in 2014 and Growing 23.1% Over 2013. May 28, 2014. Retrieved from http://www.idc.com/getdoc.jsp?containerId=prUS24857114.